Moster Madness is a progressive jackpot video slot suite by Top Game Technologies (makers of Bingo Slot). Out of the series of video slots, only one holds the progressive jackpot: Dioblo 13. It has an initial jackpot of $8000 and has 5 reels with 13 paylines. 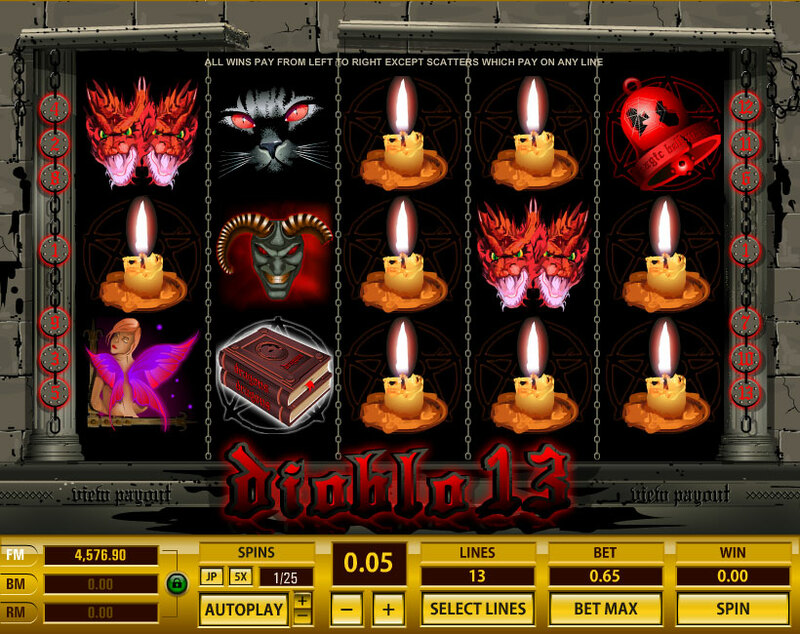 This game is themed after horror and darkness with such symbols as skulls, demons, 2-headed dragons and black cats. Other symbols carry special prizes like the she-devil, the bell, the candle and the book of secrets. You can place bets using coins as small as $0.01 and as big as $5 on up to 13 paylines making the max bet amounts $0.13 and $65 respectively per spin. You can also get free spins and bonuses. The bonus feature is unlocked when you hit 3 or more wizzard symbols anywhere on the reels having bet the max amount. On the bonus feature you get to open one of two doors with a prize of 2250 coins. The free spins feature is triggered when you hit 3 fairy symbols at the same time on reels 1, 3 and 5. You get 13 free spins in total. The wild symbol is a haunted castle and will replace any other symbol except for the fairy and wizard. If you hit 5 haunted castle symbols having bet the max amount of $65 you will take home the progressive jackpot.